These days 40 year old Rega Research operates in a similar manner to a design innovation consultancy firm only it specializes in Hi-Fi products with a strong engineering perpective. Certainly the impression one gets touring round the Rega facilities is not one of corporate product development but perhaps a company that corporations would go to for help with their own product development. From this perspective the new Rega Elicit-R integrated amplifier then is clearly more than just incremental product improvements - and so it sounds. While the RP3, RP6 and particularly the latest RP8 turntables have visual design elements that are also highly functional, like the award-winning Brio-R integrated amplifier, it is on the inside where most of the innovation has taken place. 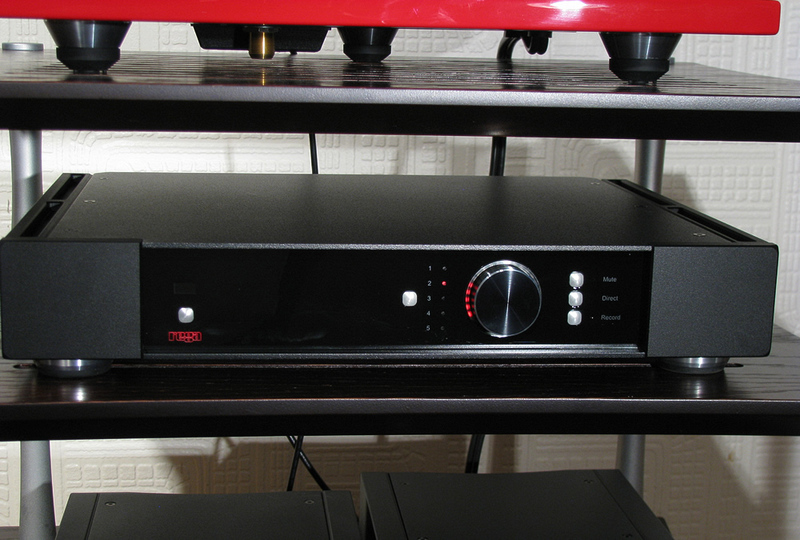 Well implemented "class A" amplifiers are known for their low distortion and highly desirable subjective quality. Class A amplifiers operate at higher temperatures and are far easier and less costly to build with good thermal stability (and therefore consistent sound) in lower power ratings - typically 10-40 watts. In higher powers the high operating temperatures have to be taken into account and components wear out faster. First developed in the Brio-R, the new Elicit-R circuit design combines a low source impedance emitter follower class-A driver stage with a Darlington type output stage to emulate overall class-A type conditions. In the Elicit-R this design has been implemented to give a very respectable 105 watts into 8Ω and 162 watts into 4Ω while operating with good thermal stability. Rega usefully specifies the "THD(Total harmonic distortion)+Noise at 1dB below clip into 8Ω using the direct input into the power amplifier is typically 0.003% at 1Khz over a measurement bandwidth of 22Hz to 22kHz". Preservation of the signal information while passing through the preamplifier section is managed by a FET II discrete line circuit first developed in the previous Elicit, and a programmable stepped attenuator volume encoder outside of the signal path. The new Elicit-R volume control operates 1024 resistors on a custom chip that retains the correct input impedance across the frequency spectrum at all volume levels and helps maintain a very linear input/output function with 0.2dB channel matching. Since capacitors are inherently non-linear and introduce signal propagation delay, their number has been kept to a minimum in both the pre and power stages and the outputs of both stages are DC coupled. DC coupling has the advantage of helping to reduce performance deterioration over time due to capacitor aging. A servo control reacts in milliseconds to protect connected devices against excessive DC voltage. A ring of 20 LEDS wrapped around the volume control of the Elicit-R visually indicates the volume level in 4dB steps with each LED activating with every four clicks of the volume control so each click corresponds to 1dB. Volume levels are thus precisely and sensibly set over 80 detectable thresholds over the 80dB range. The remote will step at 4dB LED levels unless you are quick with the button. The front panel LEDS can be set to three different brightness levels. Input #1 on the back is a versatile switchable input with two sockets for MM and another two sockets for high output MC or line level. 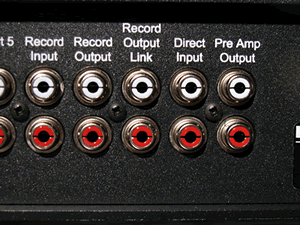 In addition to record input and output there is a second record output that can be used for headphone amplifiers with their own volume controls. 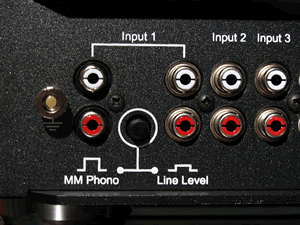 There is both a preamp out and a direct power amplifier input bypassing the Elicit's volume control. The Rega Elicit-R responsiveness and resolution with low level timbral and temporal information is completely unfettered with the freedom and delicacy of a flickering candle flame. Treble energy is not hyped up for extra space or artificially widened sound stage and there is a full measure of bass. Overall the presentation is lead by the midrange; the sound is luminous and illuminating without being overlit with an engaging intimacy. At the same time there is plenty of power available and the amplifier can be enjoyed at higher volume levels without ear numbing. The Rega Elicit-R is then a connoisseurs amplifier tuned by those experienced in listening to all kinds of musical reproduction in the home and who have perhaps encountered all sorts of stories of missuse over 40 years for you are warned in the instruction booklet "no naked flame sources, such as lighted candles, should be placed on the apparatus." Get ready to exhale in relief from the assault of MP3 sound.